The IFSW Human Rights Commission calls for the immediate release of Munther Amira, a Palestinian Social Worker who was arrested on the 27th December while peacefully protesting to defend the rights of children who had been detained by Israeli authorities. Mr Amira has previously served as the Secretary-General of the Palestinian Union of Social Workers & Psychologists (PUSWP). Mr Amira was standing up for basic social work principles. As noted by Rory Truell IFSW Secretary-General, Social workers in Palestine have an incredibly tough job trying to keep children safe from the occupying forces and the settlers. Very often social workers are arrested, shot and sometimes killed when they are performing duties that are consistent with social work values and principle of ‘respect for all people’s rights’. The Human Rights Commission has previously advocated against the detention of Palestinian children in Israeli jails. Even if children are deemed to have broken the law they should always receive age-appropriate special treatment by the authorities and not be treated as adults as required under the UN Convention on the Rights of the Child. Munther Amira was conducting his protest in a peaceful and non-violent way and should not have been arrested for his basic democratic right to free speech and to campaign for human rights concerns. The Israeli military court on 4th January extended his detention until Tuesday 9th January, after the military prosecution halted the court’s decision to release him. 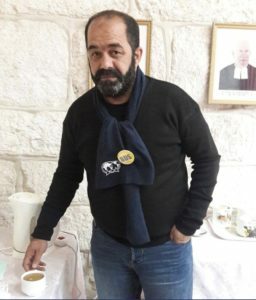 A member of Mr Amira’s defense committee has noted that the Israeli military prosecution is preparing a list of further indictments against him. The IFSW Human Rights Commission upholds that social workers are human rights defenders who stand up for peace, human rights and social justice. We support Mr Amira’s commitment to upholding the ethical principles of our profession and demand his immediate release. IFSW and the Human Rights Commission request our members in all countries to write to their Israeli embassies requesting Mr Amira’s release, stressing that the role of social work in situations of conflict is focused on building peace and reconciliation. The social work role in mediation and conciliation, building sustainable, inclusive communities should be respected and facilitated. The Commission also calls for all people to sign the online petition. “The Israeli Union of Social Workers fully supports, and its members advocate for, the rights of all juvenile offenders to be accorded treatment appropriate to their age. However, we cannot support the unconditional release of Munthar Amira while participating in a violent demonstration. Even from the edited video link it is clear that the minors present were using slingshots to pelt the police with stones and set fire to tires to block the traffic. We do not know what the charges are against Mr. Amira, but we are sure that, as the sole democracy in the Middle East, he will have a just and decent court hearing (as all Israelis and Palestinians receive in the Israeli courts). Arrests are made based on actions, not a person’s profession. It is also important to note that Mr. Amira was present at the demonstration as the head of the Popular Struggle Coordination Committee, a group that promotes and organizes demonstrations of this type. IFSW has continually made statements calling on the Israeli Union of Social Workers to acknowledge the occupation and its consequences and to act as advocates for the end of the occupation. This is in accordance with the Global Definition of Social Work which defines social work as a profession for human rights and social justice. A change.org petition for the unconditional release of Munther Amira is available to sign at this link.